Premier Smith: "Keeping Our Promise". Ladies and gentlemen, good morning! Today, we are here to celebrate the continuation of progress. From day one, I have always promised that this Government would push the pendulum of this Territory in the direction of progress, growth and advancement. And, here we are today, making good on yet another promise. A promise made, and kept, that electricity generation would be improved so that it meets the growing consumptions of our economy. Today, we are keeping our promise! A promise where we are upgrading the Territory’s electrical infrastructure so that the reliability on power supply is not just a mere vision, but a reality. And, more importantly ladies and gentlemen, we are keeping our promise of addressing load sheds, electrical dips and intermittent inconveniences so that the anxiety our people feel becomes the calm in our community. I want to thank the dedicated employees, managers, and board members of the BVI Electricity Corporation, both past and present, for their commitment to providing quality service to our people. Your role in this Territory is the most crucial and critical one. 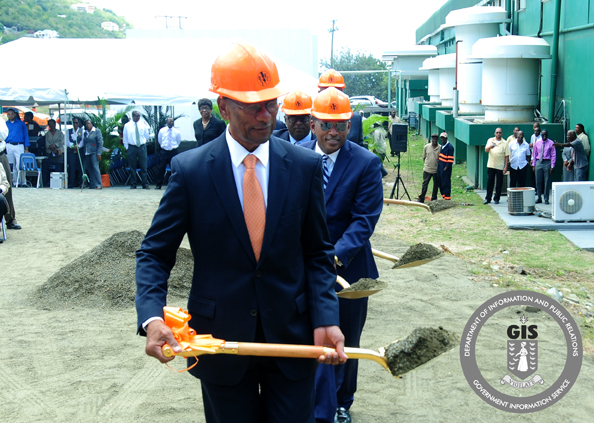 The BVI Electricity Corporation is important to our economy! Without electricity, much of what we do today as a productive and thriving economy would be stifled. Without electricity, there would be limitations on the services we can offer as a destination. Without electricity, it would be impossible for us to create a competitive jurisdiction. So today’s groundbreaking is necessary. I remember the days when we did not have electricity flowing through our homes and our businesses. Some of us had battery operated radios. Others had those that you wind-up. With the absence of a refrigerator, we corned our fish and meat to keep them preserved. Now today we have switches, fuses, sockets and meters powering the necessities and commodities of life. Indeed, we have come far. In the early 1950s it was the Late Hamilton Lavity Stoutt who championed the strong foundation we are now building on. Today, thanks to the commitment of successive governments and the dedicated team at the corporation every household and business throughout the Virgin Islands have electricity. I am pleased that my Government was able to ensure that Phase four A in 2005 and Phase B in 2006 were completed where we replaced the Rolls Royce engines with WARTSILA units. Now here we are again, in 2015, nine years later to extend this facility by adding two new WARTSILA generators, a new central control room, and transmission cables between Pockwood Pond and Long Bush. So, today is indeed an important day. Today is a day of progress. Mr. Abraham, I want to thank you and your team for working diligently to improve the electricity supply to the people and visitors of the Virgin Islands. And, with Mr. Ron Potter leading the board and I have no doubt that you would continue to work together to ensure that the BVI’s electricity infrastructure complements the public we serve. I also know that you are also having conversations with the Ministry of Communications and Works about renewable energy to reduce our dependence on fuel driven energy. I know that you are also speaking about effective ways of lowering electricity costs for all residents and businesses in the Territory. I encourage you to continue to explore the alternatives. In 2011, I gave Honourable Vanterpool the baton to lead infrastructural development. I have asked him to keep that as a high priority in his ministry’s work plan. I am pleased that he continues to be an engine propelling transformational change, and pushing the modernization of services that his ministry provides. His ministry is an important one, as it affects all of us from the time we get up in the morning to the time we go to bed at night. So, ladies and gentlemen, today’s groundbreaking is not just about my Government moving the pendulum towards progress, but rather about those customers who depend on the corporation for stable power supply. Today is about the completion of the new Peebles Hospital and the corporation’s capacity to keep pace with the demands. It is about the completion of the new cruise pier and our marketing strategy to turn day trippers into overnight arrivals. It is about us building international relationships driven through technology like video conferencing. It is about us building a legacy of entrepreneurs, as small businesses are created to drive this economy. It is about us continuing our efforts to outfit the school libraries and classrooms with powered technology to advance learning. It is about us paving the way to extend the TB International Airport and completing the new Iris O’Neal Medical Centre on Virgin Gorda. You see, in any economy, as you build-up the different sectors; so should the power of the Territory’s electricity operations keep pace. The Virgin Islands must not be left behind. We must continue to keep pace with the rest of the world. For me, it is about a better Virgin Islands! A better standard of living! And, a better quality of life for all of us! We must build a strong foundation for our children to build on.